The medical term for dry mouth is Xerostomia, which is described as being "the subjective feeling of oral dryness, which is often (but not always) associated with hypofunction of the salivary glands". 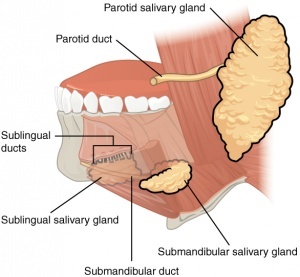 This image shows the 3 main salivary glands. The Sublingual and Submandibular glands are supplied by the Facial Nerve (7th Cranial Nerve); the Parotid gland is supplied by the Glossopharyngeal Nerve (9th Cranial Nerve). In addition to these 3, there are more than 800 minor salivary glands spread out throughout the oral mucosa. These minor salivary glands are supplied by the Facial Nerve. It is worth noting that in the region of 65-70% of saliva in the mouth is produced by the submandibular glands, even though as you can clearly see in the image, they are much smaller than the parotid glands. NB Sometimes people with dry mouth problems are advised to chew gum as a means of increasing saliva production. However, in cases of facial palsy it is considered by many experts to be inadvisable to use gum as this often tends to increase synkinesis. People with dry mouth should increase their dental care regime, as they are at increased risk of both tooth decay and gum disease. For people with facial palsy, it is important to provide extra care to the teeth and gums on the palsy side of the mouth, as saliva provides an important protection against both tooth decay and gum disease.